Does nothing matter? It shouldn’t do. After all, nothing is …well… nothing. But…if everything started from nothing, so we are told, then nothing must contain the seeds of everything. How could everything come from nothing? In fact, how does anything come from nothing? And if it did, would that mean that nothing is something? That’s what this website is about: questions. Attractive section of content. I just stumbled upon your site and in accession capital to assert that I get actually loved account your weblog posts. Anyway I will be subscribing on your feeds or even I achievement you get right of entry to persistently rapidly. Nothing matters? But then, what does matter(s) mean. Vacuous emptiness from which all matter arises. Even CERN hasn’t been successful as of yesterday. Jam tarts are better than nothing, right? But nothing is better than heaven. Therefore jam tarts are better than nothing. And the Gershwin song goes: “I got plenty of nothin’ and nothin’s plenty for me”. I like the way you look at existence but really nothing is something. The absence of anything calls for the existence of something be it a void or black hole or awkward silence. So really we are everything and nothing. As soon as you create something, you create its opposition, nothing, as soon as there is nothing there is something. In the end when your physical existence ends all that matters is if you die in comfort with your life. If you have read my book, you will know that I differentiate between Nothing (the absence of everything) and nothingness (the absence of something). As such, your comments refer to nothingness, which, I agree, is something. And you are right that as soon as you create something, there is its opposite. This, however, does not work with Nothing (the absence of everything). The absence of everything includes ourselves, so that we would not be around to be exposed to anything. When there is Nothing, there isn’t anything. When our physical existence ends, nothing matters. What do you discern from Ecclesiastes 1:18? Tyrone, you mean the more we know, the more miserable we will be? If that means that we are happy when we are ignorant, I don’t agree. It is rather an arrogant and elitist statement. But what is the connection to “nothing”? Is it that if we know nothing, we will be happy? The less we know the better off we are? Isn’t that what Ecclesiastes 1:18 says, in effect? Skimmed through this at Barnes and Noble the other day… looks very well written. Wondering if you relate this subject to Eastern perspectives of Advaita/nonduality? Thanks, Karl. In the chapter “Believing in Nothing” I look at a wide spectrum of religions and examine how they relate to “nothing”, and note a common denominator. I also compare how Western monotheistic religions and Eastern religions relate to “nothing”, and find that while ostensibly “nothing” is important – essential – to both, they are, in fact, different “nothings”. Nothing comes from nothing, nothing ever could. I must have done something good. of your blog post. I’ve sent your website link to her. We get pleasure from your thoughtfulness within this difficult time. 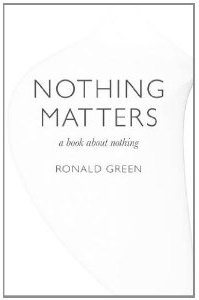 Ronald Green’s no nonsense account of “nothing’ is both refreshing and informative. The background and extension into current thinking is nicely done. If only there were more clear headed thinkers like him around we would be…. well, more clear headed! Thanks Ronald, I appreciate what you have done here. well nothing matters or “No Thing” matters Awaken to live in the moment of now! and realise that all that happens right now is all we ever have. all else is contaminated by past memory or future thought creating an illusionary moment, Far better to focus on where you are and realise that all mind thoughts are life denying they take you away from who you really are. situations only even happen in the NOW! and can be dealt with easily its only when we attach past thoughts and future “what ifs” can the situation become potentially a problem in our minds and create emotion and upset. Listen to your thoughts become a watcher but realise this you are more than your thoughts. Notice the thought but do not attach to it then you will be able to leave it and realise that “no thing” really matters as all things change, fade away and disappear the only thing that stays is the real you the person that is listening to the thoughts the imposter in your head pretending to be you. ” YOU ARE MORE THAN YOUR THOUGHTS” realise this and peace will come.